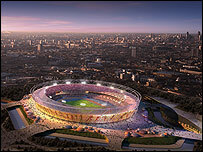 Construction of London's 2012 Olympic Stadium in Stratford is to start three months ahead of schedule. The Olympic Delivery Authority (ODA) said work to clear the east London site had progressed quicker than expected and building will now begin in May. Many buildings have been demolished and 800,000 tonnes of contaminated soil has been removed since the clearing work in the Lea Valley area began last July. The 80,000-seater stadium will cost £496m to build. The venue will be the focal point of the Olympic Park which will also house the aquatics centre, the velodrome, the hockey, fencing, basketball and handball arenas and the international media centre. After the Games the stadium will be scaled back to 25,000 seats. It will retain a permanent athletics track, although no long-term tenant has been found. "We have investigated the Olympic Stadium site, demolished tens of buildings and excavated 800,000 tonnes of soil," ODA chairman John Armitt said. "Now that we have finished the work to dig the bowl, where the opening and closing ceremony and athletics will take place in 2012, we are firmly on track to start construction work ahead of schedule." The ODA said a small amount of radioactive soil was found and is being stored separately to be disposed of safely.